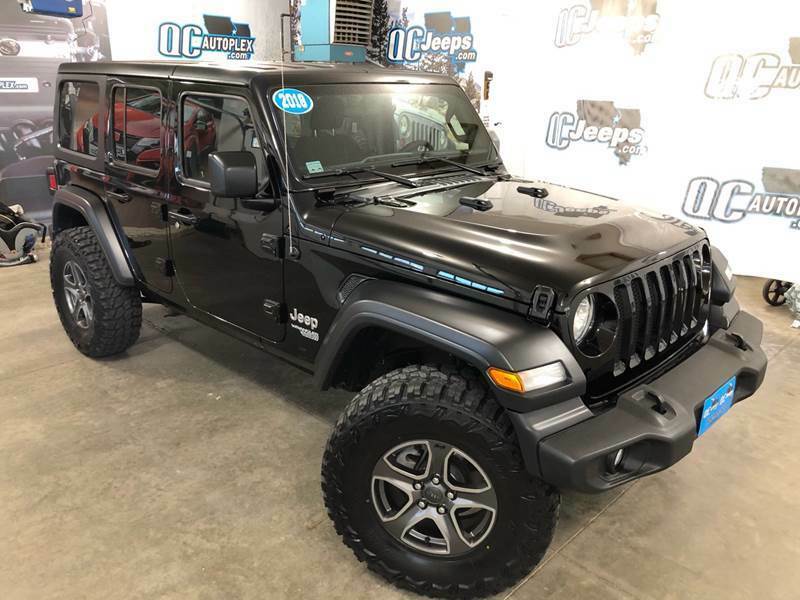 2018 Jeep Wrangler Unlimited Sport JL (new body style) 2K Miles Color: Black Transmission: Automatic 3-Piece Hard Top New Upgraded Tires! Bluetooth Keyless Entry Remote Start Heated Seating Heated Steering wheel Reverse Camera Engine: 6 Cylinder 3.6 Liter Clean Jeep inside and out like new. $36,950 With Financing Available as low as 3.74% please call or text 309-945-6227 For walk around video and virtual test drive, COPY and PASTE the following link: https://youtu.be/a04F4k__qjg WWW.QCJEEPS.COM WWW.FACEBOOK.COM/QCJEEPS **309-945-6227** 110 S 9th Ave Eldridge, IA 52748 OPEN 6 DAYS A WEEK 9AM-6PM MON-SAT or by appointment anytime after hours! Check the website for even more WWW.QCJEEPS.COM WWW.FACEBOOK.COM/QCJEEPS WWW.QCJEEPS.COM (309)945-6227 The front windshield is in excellent condition. The paint is in great shape and condition. No dings are visible on this vehicle. The interior was well maintained and is extra clean. The exterior was well maintained and is extra clean. The engine is functioning properly and has no issues. The transmission shifts very smoothly. The brakes are in great condition. The battery is in excellent condition. The car was previously owned by a non smoker. A full size spare is included with this vehicle. This vehicle comes with a spare key. V6 3.6L Natural Aspiration, 1,946 mi. V6 3.6L Natural Aspiration, 13,121 mi. V6 3.6L Natural Aspiration, 15,787 mi. V6 3.6L Natural Aspiration, 61,597 mi. V6 3.6L Natural Aspiration, 44,422 mi. V6 3.6L Natural Aspiration, 21,184 mi. V6 3.6L Natural Aspiration, 29,020 mi. V6 3.6L Natural Aspiration, 37,689 mi. V6 3.6L Natural Aspiration, 42,529 mi. V6 3.5L Natural Aspiration, 27,002 mi.